This is the little known story of the Royal Navy’s secret X-Class midget submarines that were built to sink the most powerful German surface combatants, but ended up paving the way for British forces landing at Sword and Juno beaches on D-Day. The X-Class was built as a new approach for taking down Germany’s most powerful warships, namely the battleships KMS Tirpitz and KMS Scharnhorst. Traditional forms of naval warfare were not getting the job done, and Nazi Germany’s powerful North Sea Fleet was a constant bane to Atlantic shipping. 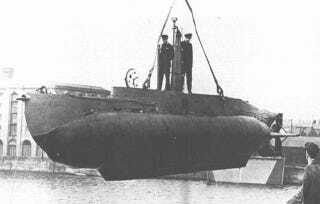 Thus the 52 foot midget submarines were seen as an unconventional approach to dealing with a very serious threat. A secret submarine development and training base was established in 1942 at Lock Erisort in Scotland to bring the X-Class concept to fruition. By 1943 the first versions of the X-Class boats were in the water and although they weren’t comfortable for their four man crew, they were capable for their day. They could dive to a depth of 300 feet and could travel 600 miles surfaced or about 80 miles submerged. This was far lower than their 1200 mile design goal, but there was only so much that could be done considering the technology of the day and the boat’s tiny size, having just a 30 ton displacement when submerged. X-Class boats were powered by a four cylinder, 42 horsepower diesel engine made by Gardner which was taken directly from those commonly used on London buses of the era. This was paired with a 30 HP electric motor for submerged operations. Maximum speed was about 6 knots and about a third of that when running submerged on electrical power alone. The four man crew included a commander, a pilot, an engine room artificer and a diver was later added when an airlock was installed as part of a major redesign of the class. Weapons were attached to the sides of the craft, which were usually two mines packing two tons of Amatol high-explosive each. The idea was to drop the mines to the ocean floor underneath a target and then quickly leave the scene before the time-fuse detonators set the explosives off. The resulting ‘lift’ from the explosion would break the target ship’s keel in two. In practice, the X-Class (also called X-Craft) would be launched from another submarine or tender ship and then they would make their way to their targets on their own. They had a periscope to see where they were going along with sonar, and they were rigged with elaborate magnetic generators to mask their magnetic signature. Conditions onboard were dismal for the crew which could not even stand up and were cramped into a tiny space for days at a time. The X-Craft’s first use for their originally intended purpose was during Operation Source which occurred in September of 1943. A pack of six X-Craft were sent to destroy Nazi warships based in Norway. Only two of the six successfully planted their charges below ships in port or at anchor. These charges were under the Battleship Tirpitz, which was damaged in the attack, putting the ship out of commission for almost six months. Some of the six X-Craft employed on the mission never even made it back to their tenders. By 1944 another batch of more advanced X-Craft, numbers X20-X25, were ready for combat. Their goal was to attack the floating dock at Bergen, Norway. X24 went on this mission and sunk a 7,500 ton merchant ship in the process, although the floating dock stayed intact. The same operation was repeated by the same submarine on September 11th, 1944, and this time the little sub shacked the entire dock. Mission accomplished. Before and between these two attacks on Nazi ships berthed in Norway, the X-Craft made history along with thousands of Allied soldiers, seaman and airman, by participating in Operation Overlord, the invasion of Nazi occupied France. The allies were in desperate need of intelligence on Nazi fortifications, seabed topography and sand content along the French coast. X20 was sent to clandestinely survey this area, spending four days collecting intelligence via sonar, its periscope and its frogman divers. For two nights, X-20 would sneak up on the coast and its frogmen would swim ashore to collect soil samples in condoms and use a compass with a gradient level and stakes to measure distances along the beaches. For self defense, the two divers only carried a .45 pistol and a bandolier of ammo. A flask of Brandy was provided to counter the cold temperatures of the water and to survive the stress of such a high-risk mission. After two nights of running operations ashore on what would become Omaha Beach, the crew was supposed to go survey Sword Beach, but they were simply too exhausted and the weather was getting dangerous for the little submarine. X-20 returned to Britain’s master submarine base Dolphin on the 21st of January 1944 with critical intelligence in hand. The X-Craft went back to the French coast for Operation Gambit, Britain’s part in Operation Overlord. X-20 and X-23 took up station off of Sword and Juno beaches five days before June 5th, 1944, D-Day’s original execution date. Once on station, they dropped to the sea floor waiting for the signal that the invasion would come the next day. They occasionally popped up for a quick periscope recon, even spotting unaware German soldiers playing football on the beach. They also had to surface every night at 10pm to listen the BBC news broadcast for a coded message that would tell them if the operation would commence the following morning. During one of the news broadcasts the code was sent that the landings would be delayed a day. This was a major issue as the crews had a finite amount of oxygen and supplies to last them, and the margins were already very slim. They proceeded anyway and at 4AM on the morning of June 6th, the crews of X20 and X23 raised a navigation mast with a bright light shining only seaward. This bright directional light would be used as a beacon so that landing craft could easily navigate their way to the correct beach and to avoid obstacles and rock shoals to the east. Also, a radio beacon and echo sounder were installed on both X-Craft that would allow them to communicate with mine sweepers and other ships that were making their approach to Sword and Juno beaches without using a radio. The crews knew the invasion was finally underway after receiving the coded message the night before, when waves of bombers flew over their positions, each dropping long strings of bombs on German positions along the beaches. Many of these positions the X-Craft had identified during its surveillance missions months earlier. Within hours, the landing craft had locked onto the mini-subs light beacons and they made their terminal approach accordingly. The use of the X-Craft to guide in the invasion force was viewed as a massive success. Although the Canadians and British saw the X-Craft as key to hitting their targeted landing areas, the Americans declined their participation, instead relying on their own instruments for terminal navigation. This was probably a mistake as American landing craft heading to Utah beach ended up drifting towards the west by the strong current and other ships waded ashore in the wrong locations entirely. In all, 23 sailors died serving aboard X-Class boats, 16 of which were officers. After the war only five of the shadowy craft remained, with all but one falling victim to the scrapper’s torch. Today, the only X-Class survivor is X24, which is on display at the Royal Navy Submarine Museum in Gosport. It stands as a humble tribute to the heroes that rode such an inhospitable machine right into the most hostile places in the world.